In Eastern Europe and many countries, including Israel and the United States, these brilliantly colored windows honor Biblical passages held in esteem by religious congregations and Christian leaders. For that reason, “Poor Man’s Bible” is a popular phrase in modern days when discussing stained glass windows. During medieval times, the poor were mostly illiterate and could not afford Bibles. Therefore, the depiction of Biblical events in stained glass windows was a source for the illiterate to understand the events and lessons in the Bible. Regardless of the role of stained glass windows in churches, for decoration or for lessons, one cannot deny the luminescent beauty of the stained glass. 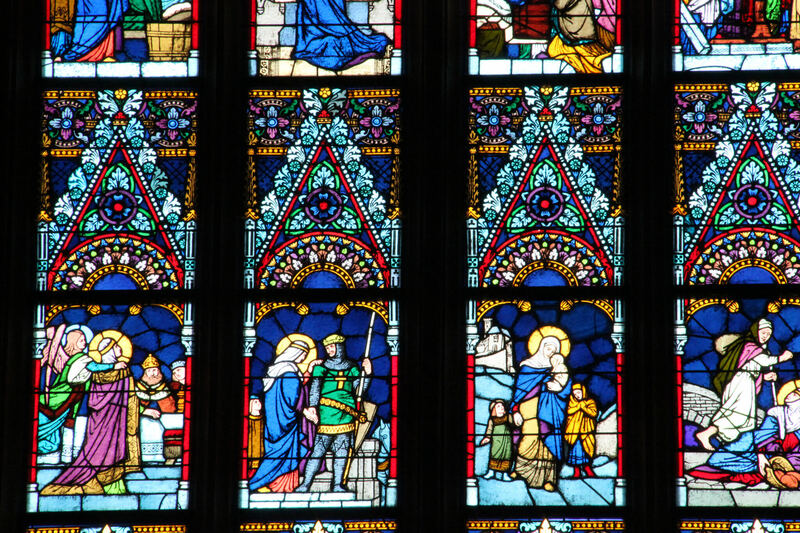 In addition to similar Biblical events, stained glass windows also share many other characteristics, such as the symbolism behind the usage of certain colors. 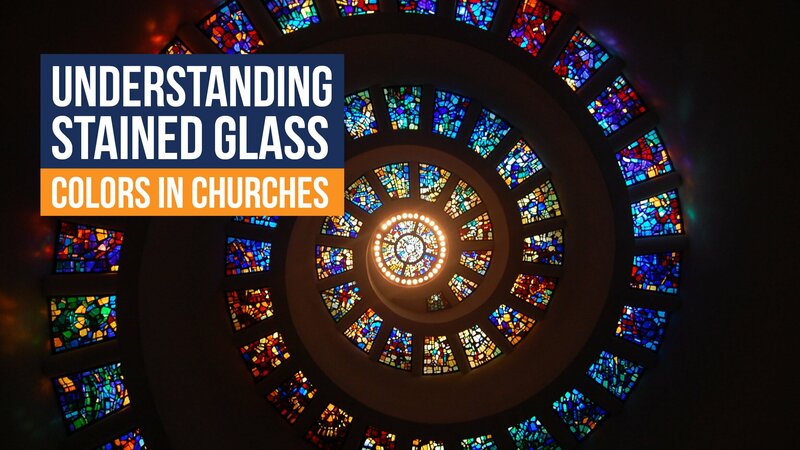 In Christian churches around the world, the colors used in the stained glass windows that adorn their churches and depict revered passages are of utmost importance. Heroldonline.com and Glass by Knight, a stained glass art studio, explain the significance and symbolism behind the usage of certain colors in religious stained glass. Red: represents the blood of Christ, it indicates strong emotions such as love or hate; it serves as a reminder of Jesus' suffering and sacrifice, it also often associated with the martyrdom of saints. Blue: the color of the sky symbolizes heaven, hope, sincerity, and piety. The color is often associated with the Virgin Mary. Green: the color of grass and nature is an indication of spring, growth and rebirth, life over death; it symbolizes faith, immortality, and contemplation. Violet: symbolizes love, truth, passion, and suffering. White: the color that represents chastity, innocence, and purity is often associated with God. Black: it is somewhat rare to see black as the focus color in a stained glass window; the color has close ties to death and regeneration. Yellow: although the color is sometimes used to symbolize treachery, such as in depictions of Judas, it is more widely used to indicate the halo of saints, or the Gates of Heaven and to symbolize divinity, power and glory. Purple: it is believed that Christ wore purple before His crucifixion so the color has come to symbolize suffering and endurance; purple is also used to depict royalty or God the Father. Gray: a symbol of humility and mourning, it also represents the immortality of the spirit. Brown: the symbol of spiritual death and renunciation of worldly things. Rainbow: symbolizes union and God’s covenant with humanity. With the multitude of colors used in stained glass, it’s no wonder that there are deep meanings behind each of them. Does this help you interpret stained glass windows differently or will you experience them the same as before? Here are three more significant churches that have beautiful stained glass windows to explore in addition to the ones in our presentation, "Stained Glass Wonders". Israel’s Church of the Flagellation, which marks the Second Station of the Via Dolorosa, contains three large stained glass windows. 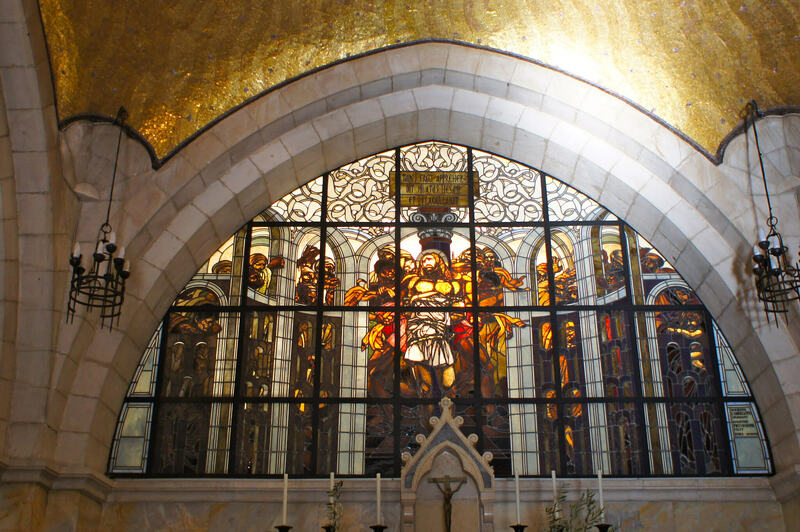 The first stained glass window is on the left, when facing the main altar; it depicts Pontius Pilate washing his hands from the sin of ordering Jesus’ crucifixion. The second one is in the center, directly behind the altar; it shows Jesus being flogged and a crown of thorns placed over His head. To the right of the altar, one would find the third stained glass window, which illustrates Barrabbas’ joy from being released instead of Jesus. The Christ Episcopal Church, in Poughkeepsie, New York features more than 10 stained glass windows throughout the building. The windows were designed by William Potter, a designer who was well-known for his work and had a personal connection to the parish. All but two of the windows were designed and built in 1910. According to the church's website, several of the church’s windows are inscribed as memorials to loved ones long gone. that was a la mode at the time. All that’s left of significance from the original structure are the foundations, columns, and some walls. The interior is simply marvelous with beautiful decorations by the hands of Károly Lotz and Bertalan Székely, prominent 19th century Hungarian painters who are the masterminds behind the stained glass windows that adorn the interior of the church. They are from different times and in different locations, but there is no denying the beauty and serenity that comes from stained glass windows. For individuals who want to see beautiful stained glass and to go on an enlightening tour walking in Jesus’ steps, the tour options at Gil Travel provide the best of both worlds. If you want something that is not offered, our expert agents can help you design the trip that accommodates all your needs and interests. Contact us today to learn more.